Just 5 -10 minutes’ walk away from Macau Outer Harbour Ferry Terminal as well as our hotel Harbourview, located is Fisherman’s Wharf. A theme based park and an entertainment complex featuring Old Portuguese style bright coloured buildings, multiple shops and cafes, hotels, restaurants aside a handful of fun activities. 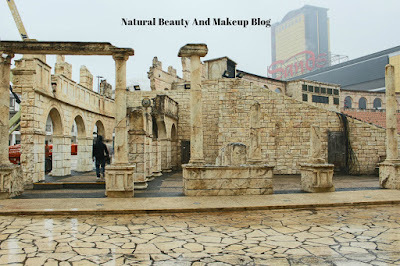 The main attraction of this place is the roman amphitheatre, a replica of the ruins of Rome Colosseum architecture. 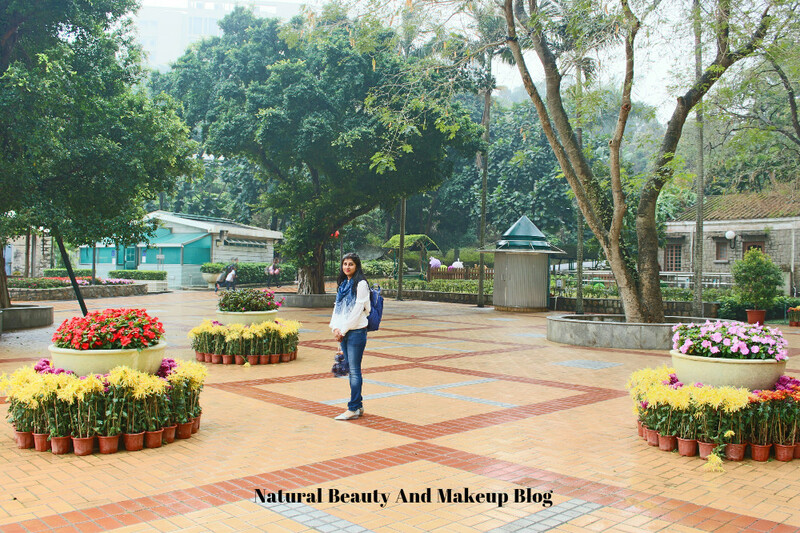 When we entered into this park, it felt like we have landed on a place straight from the heart of Rome; so picturesque 😍. But alas! 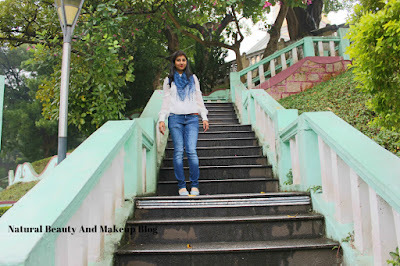 Amidst heavy downpour it got a bit difficult for us to roam around the entire park, so we took a quick stroll across it and clicked few pictures. Despite a rainy and gloomy weather, we noticed, there were a lot of visitors hanging around the park. 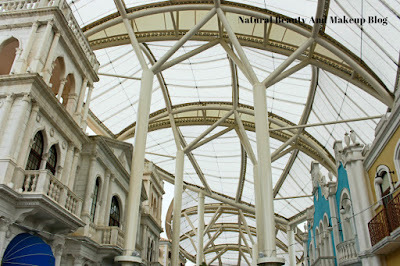 The shopping mall area is protected by huge canopy shelters, a great solution for both the rains and scorching sun rays. How thoughtful! Maximum shops and rides were closed at that time; perhaps we arrived there too early! 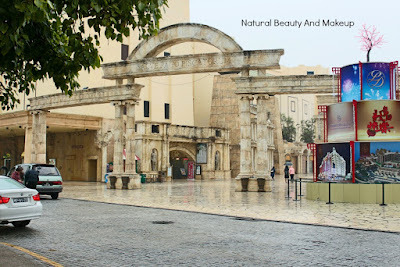 But we were also informed by some locals that, various fun filled activities are closed permanently now. The Fisherman’s Wharf comes alive in the evening time, so make sure you include this place in your itinerary for the evenings to enjoy some fine dining & shopping experience. 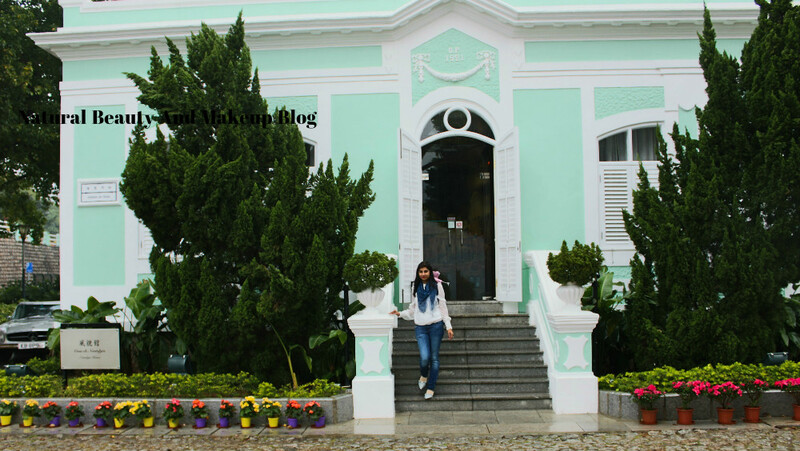 From Fisherman’s Wharf, we hired a taxi and headed off towards the Taipa island of Macau. 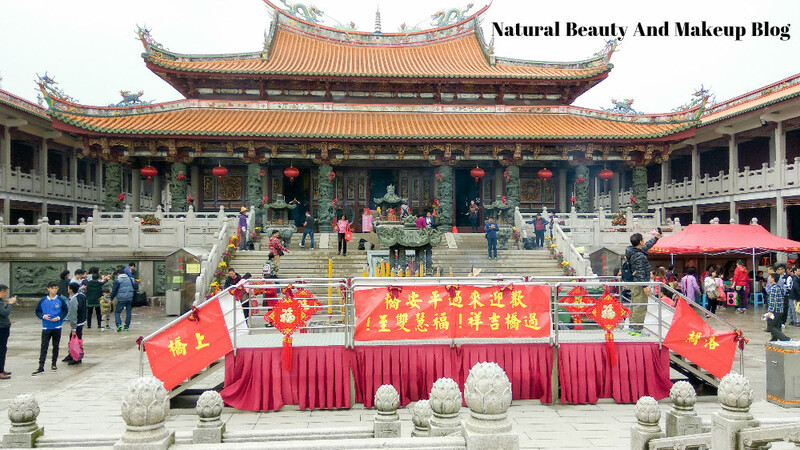 It took us 40 minutes to reach Taipa by taxi, but there are plenty of easy options also to commute to this place. (Check the tidbit part). Within a short, stipulated time it seemed mere impossible to visit all the tourist attractions in Taipa! Thus we decided to see Taipa Houses Museum first which is acclaimed as one of the top eight sights of Macau. 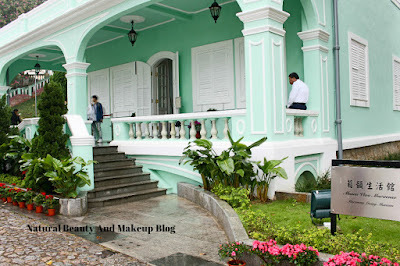 The history of this museum dates back to 1921 when these five houses served as the residences of senior Portuguese officials & the Macanese families. 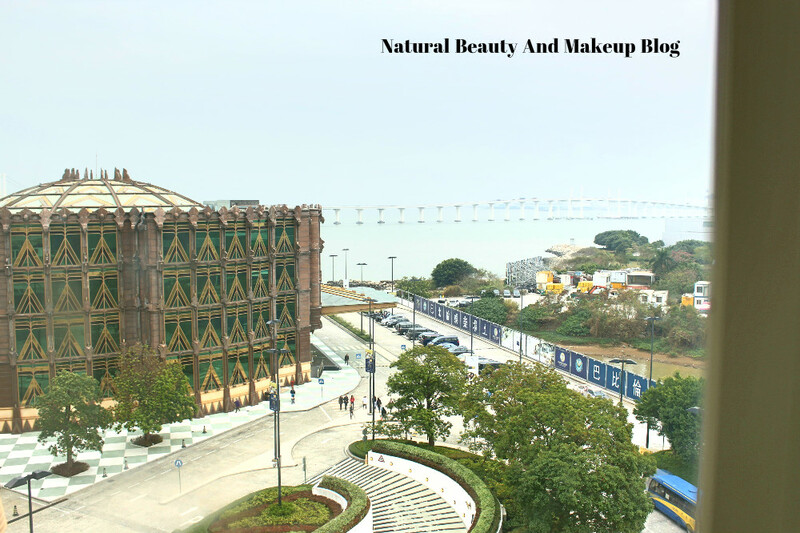 Later the government converted it into Taipa Houses Museum and renamed the five houses as ‘Macanese Living Museum’, ‘Exhibitions Gallery’, ‘Creative Casa’, ‘Nostalgic House’ and ‘House for Reception’ from west to east respectively. The pastel-green villas aka Taipa Houses Museum are surrounded by cobblestone promenade, numerous trees and a garden, overlooking a lake offering you a pleasant view. 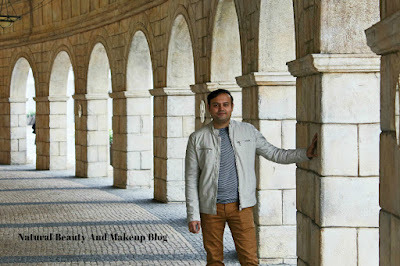 The exterior architecture of each building is different & so are the interiors. 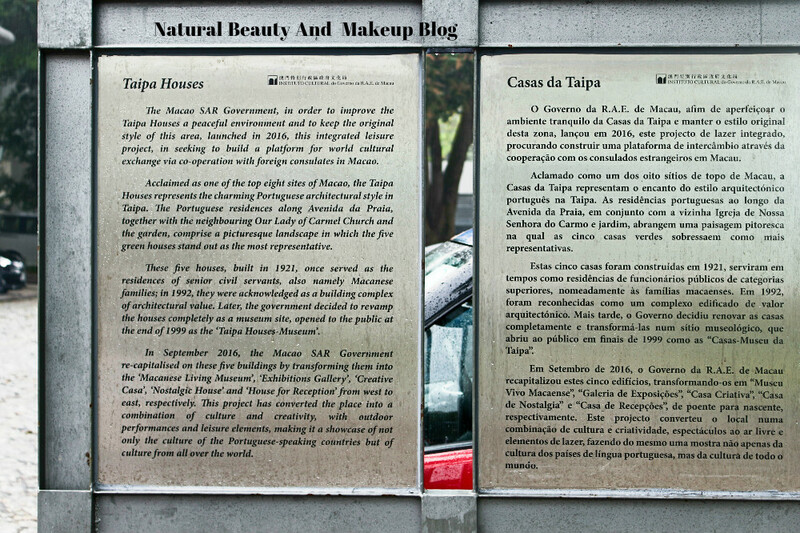 Macanese Living Museum gives an insight into the then 20th-century lifestyle of Macanese families. 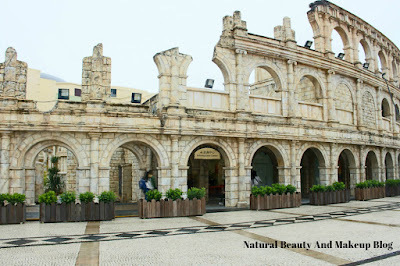 The other three buildings display the exhibits related to the history & culture of Portuguese colonial era and the island communities of Macau. The House for Reception serves as a venue for official and cultural events. 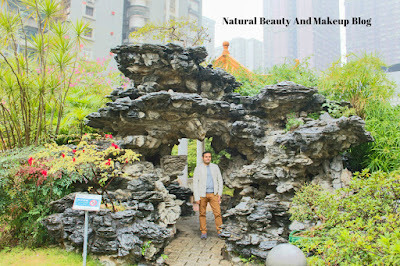 Besides viewing the museum, you can also take a stroll around the garden located just a few steps away. 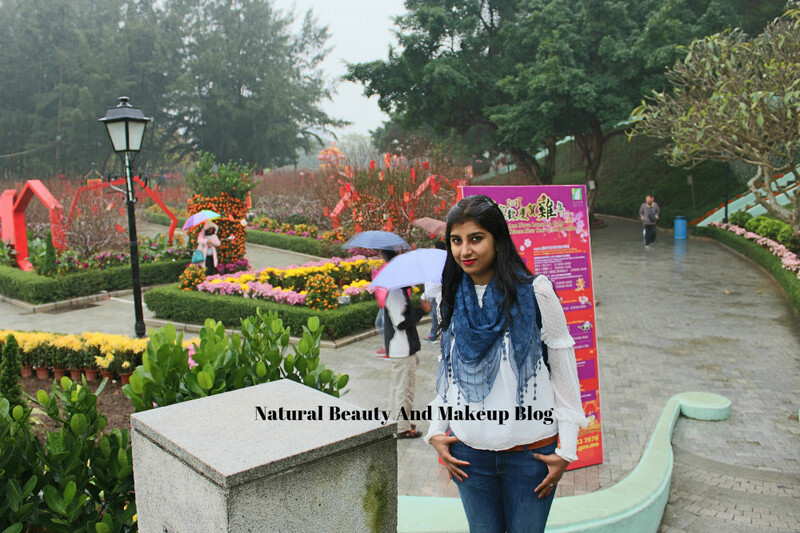 For the Chinese New Year, the colourful garden was fully decked up, but we didn’t go in as it was still drizzling! 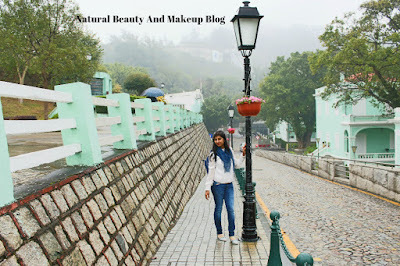 We clicked a lot of pictures around these colonial buildings and the outdoor displays. The surrounding tranquil atmosphere makes it a place worth to visit! 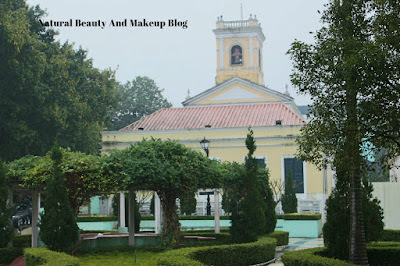 Adjacent to the Taipa Houses Museum, standing on a small hill is Our Lady of Mount Carmel Catholic Church overlooking the museum, garden and the lake. 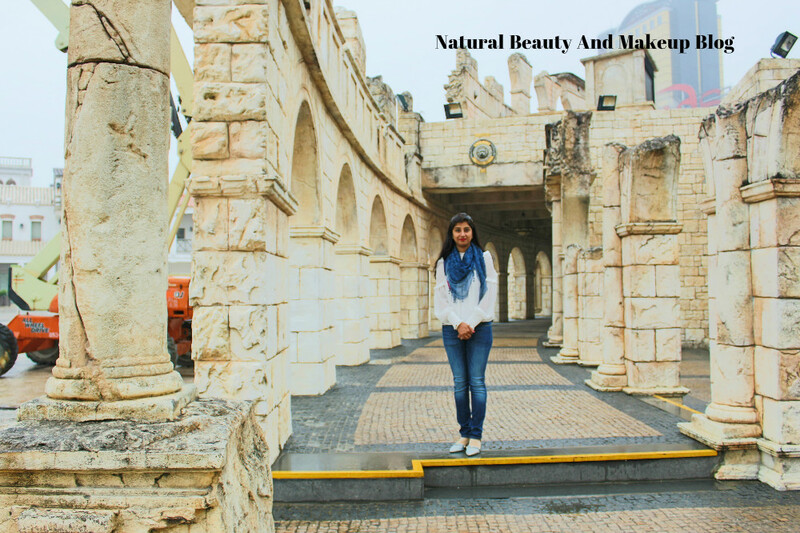 We climbed a few stairs atop to see the church, which was built in 1885 in neoclassic pattern architecture. This pastel yellow coloured church looks quite similar to the rest of the typical Portuguese style churches of Macau. 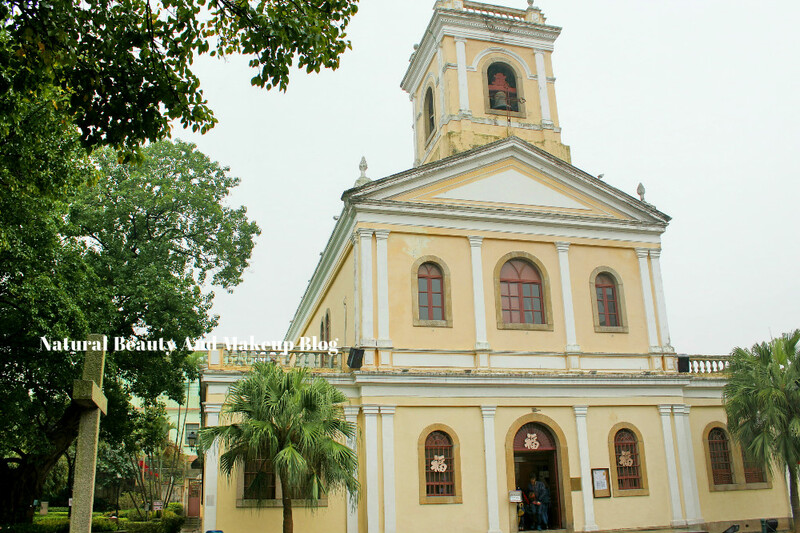 That said, the view of Cotai strip, the Skyline and the Taipa village from this hilltop church is something that you would love to gaze at. 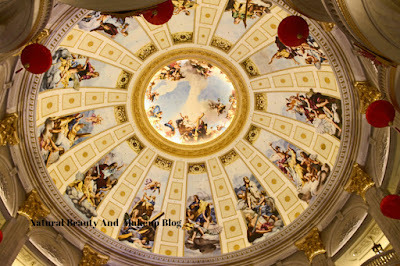 We were running out of time, so didn’t enter this church hence no idea how it looks inside. 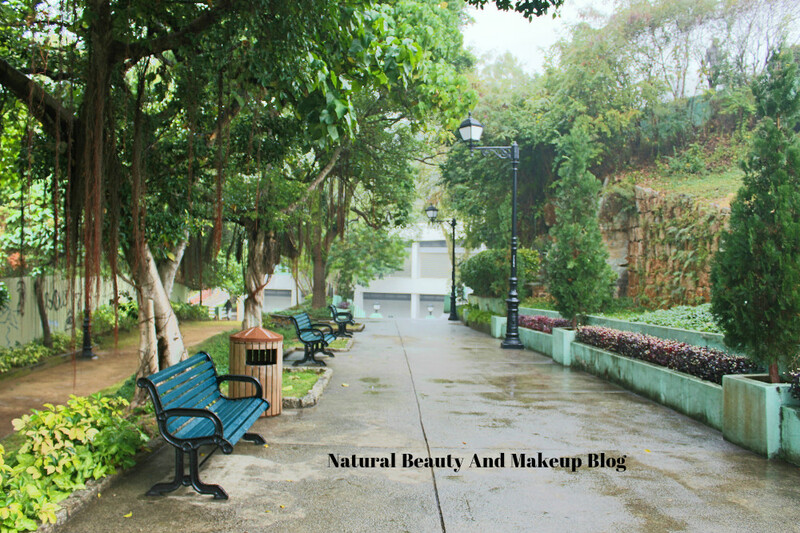 However, I loved the outside area where you can relax sitting on the shaded wrought iron park chairs or can walk along the flower garden located just at the front of the church. Surprisingly, we couldn’t spot Taipa Library! Although, on the Google map, it was showing nearby but we failed to find it out. Therefore, we moved towards our next destination. 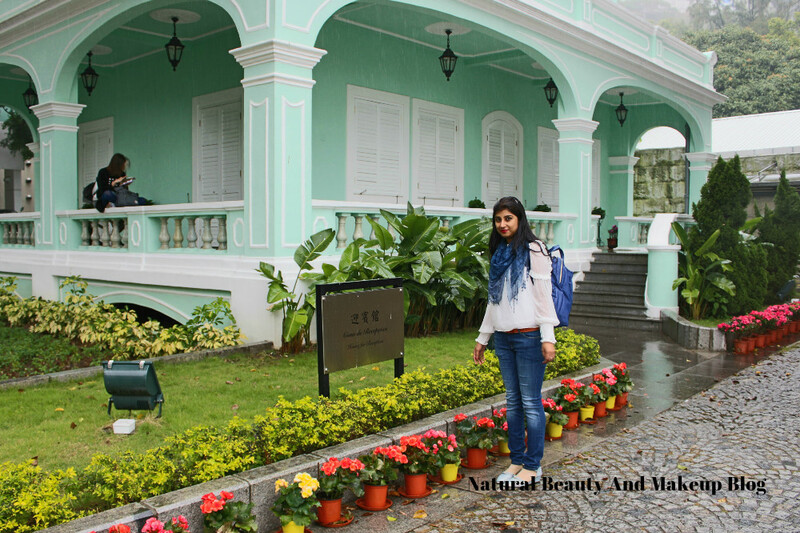 If you desire to catch a glimpse of old real Macau, then you have to pay a visit to this place, called Taipa Village. 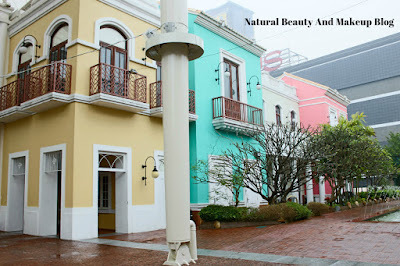 Away from the city’s hustle and bustle, Taipa village is a calm, beautiful residential area designed with tiny alleyways; Old Portuguese inspired buildings, copious amounts of eateries & shops. While traversing across the Taipa village, one thing which caught our attention was the ambience, far opposite to the fast paced, lavish Casino driven Macau peninsula. 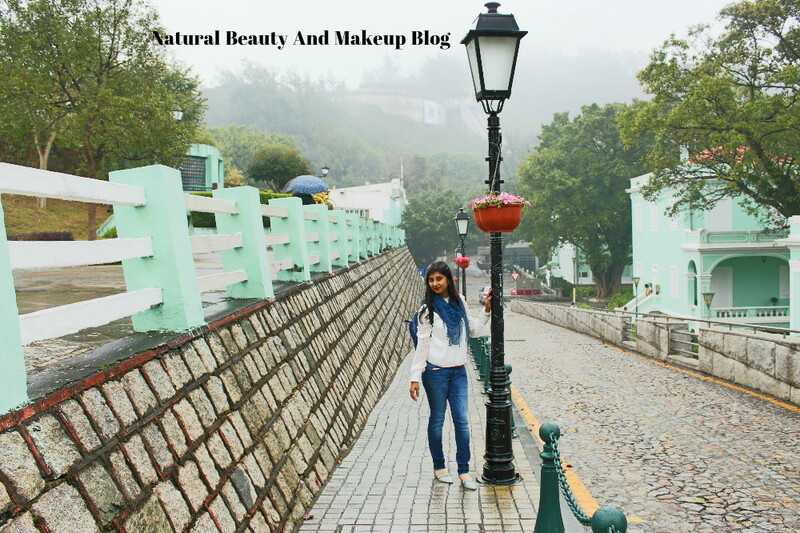 Here the laid back lifestyle, colonial buildings, narrow cobblestone streets lined up with lampposts designed with flower baskets hanging upside down, everything oozes an authentic, warm and rustic charm adding to the natural beauty of Taipa; a perfect escape from the bustling city life!! 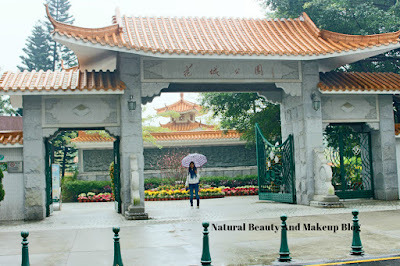 Jardim Da Cidade Das Flores Garden or the Municipal Garden is an attractive flower city park located just a few steps away from Taipa Houses Museum and a supermarket (Park 'n Shop). 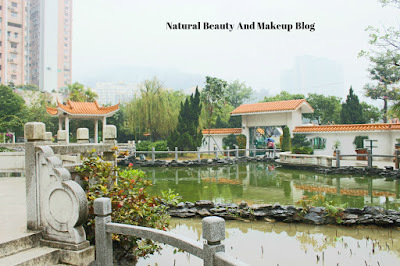 The style of this park is designed on the theme of traditional Chinese Garden which looks stunning and makes it a great place for photography as well! 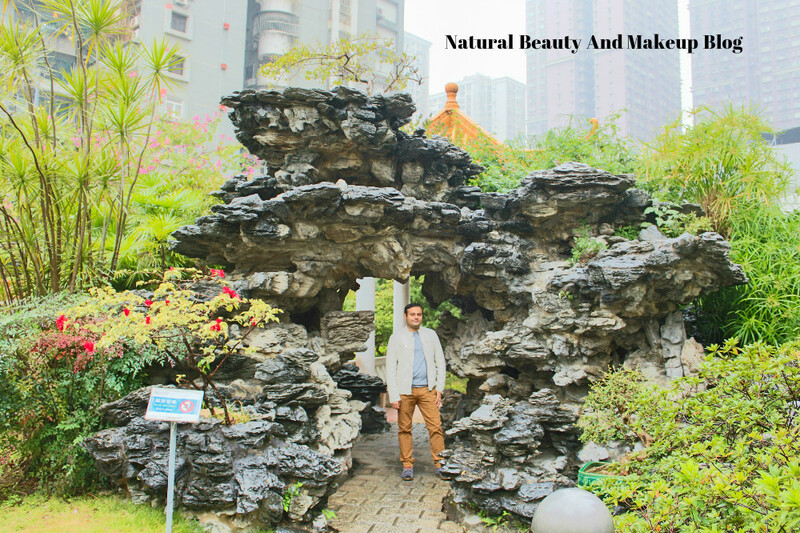 It is surrounded by a kid’s friendly playground, a fish pond where the fishes are swimming, relaxing sitting arrangements, beautiful pavilions, lovely flowers, rock formations and some nice winding bridges. 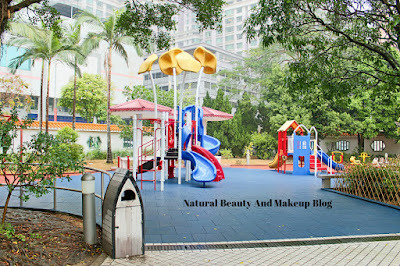 When we visited the park, noticed a few families were enjoying the day with their children. There is a pebble stone pathway which is used for the therapeutic walk. Nevertheless, we chose to click few pictures only in and around the park. Definitely, it makes for a wonderful getaway destination for the weekend relaxation if you are staying in Taipa. We took the help of Google map to locate this temple and on reaching the point found a small beautiful temple. 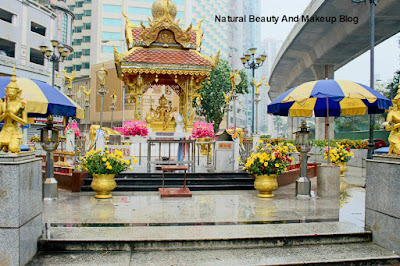 This Thai-style shrine is nearby Macau Jockey Club on Taipa Island & is situated at a corner of the main road. 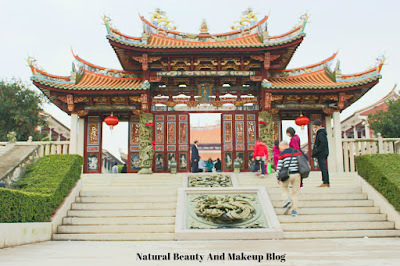 The design of this shrine is quite fascinating and it is considered as one of the main tourist attractions on this island. 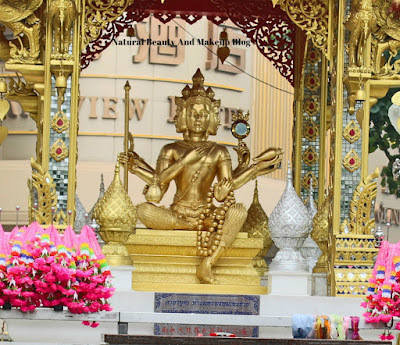 The Four Faced Buddha idol is seated inside a Thai style pavilion, holding different symbolic articles in his hands like Vedas, sacrificial spoon, a string of pearls alongside Kamandulu. Each side of the four faces represents four traditional elements of earth, water, air and fire, directed in four directions. Clad in a gold leaf, the four-faced Buddha is surrounded by four stone leaf elephants, mythical birds and bouquets. 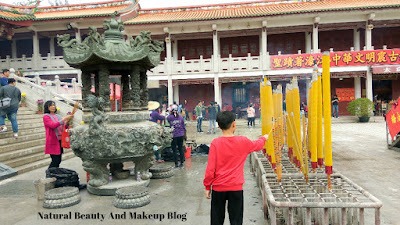 We prayed and took blessings from him and then headed for Coloane Island. 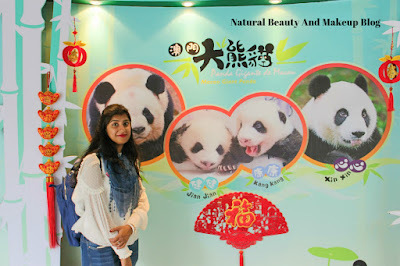 Raise your hands if you love Panda ✋😍 One of the best experiences of my Macau trip has been viewing these adorable creatures! 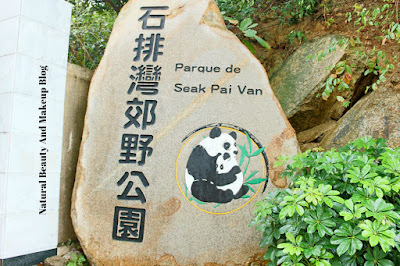 Seak Pai Van Park is a wide spaced multipurpose park located on Coloane Island, which boasts a mini zoo containing a few rare animals, a botanical garden, a lake, the Giant Panda Pavilion, a gift shop as well as a restaurant & snacks bar. The Panda Pavilion is home to the endangered Pandas and is the main attraction of this park. 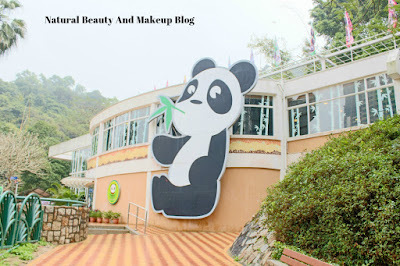 Admission to this Panda Pavilion is free for children and senior citizens whereas, for others, it is 10 MOP only! 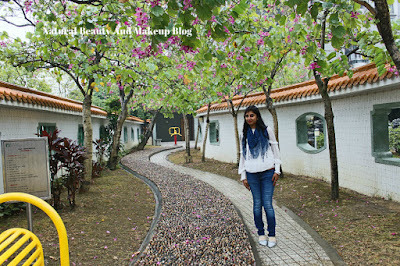 It was a holiday so the entire park was filled with children, tourists from different zones. 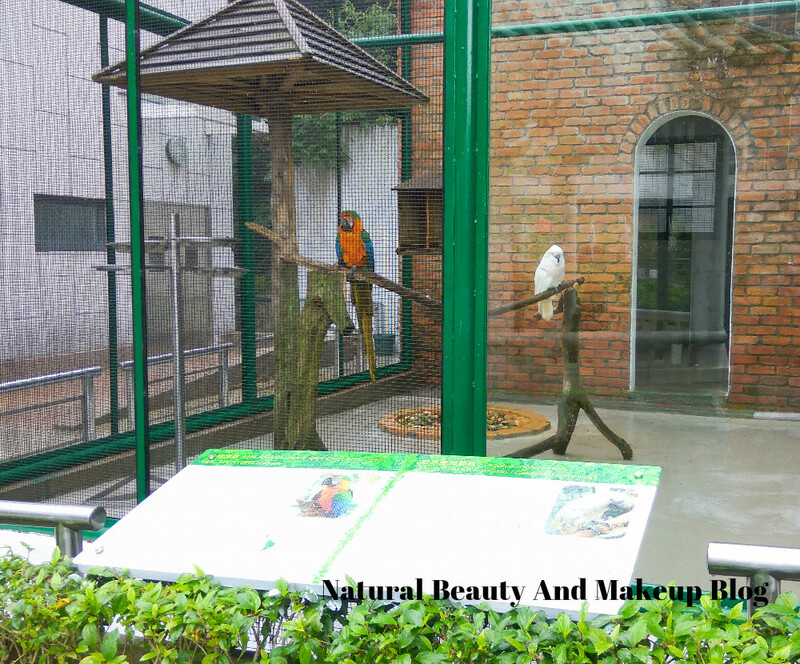 We started with the rare animal exhibition area, where the different endangered species of birds and animals are kept in individual cages. 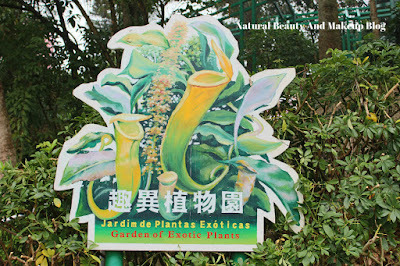 Then took a stroll around the medicinal garden where different species of trees are planted. 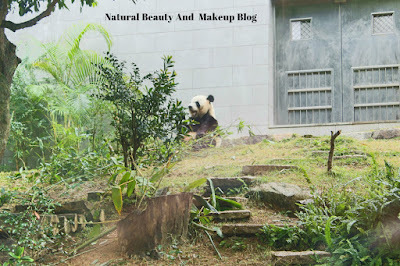 And lastly, with full excitement, we entered the panda pavilion to get a glimpse of those cute Pandas. 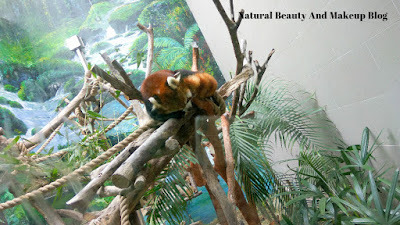 Out of the two imported red pandas, one was asleep and the other one was awake & seated on a tree branch. 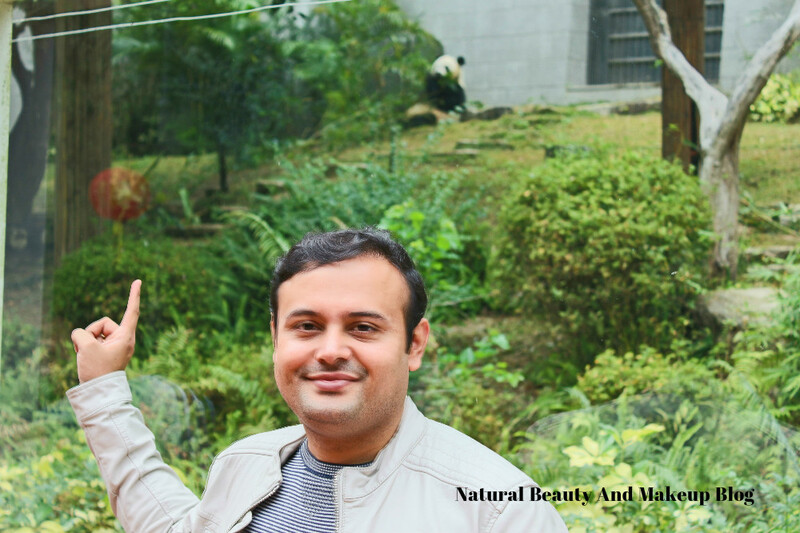 There is even an indoor TV screen, which telecasts the live movements of these pandas, in case you miss watching them closely. 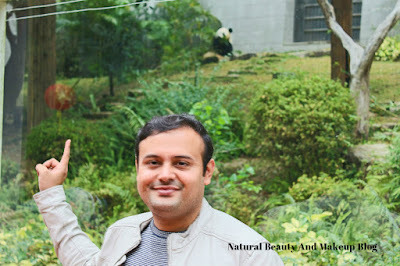 Amongst the giant pandas, one was not visible from the viewing area whereas the rest one was too busy munching on bamboo shoots to look at us. 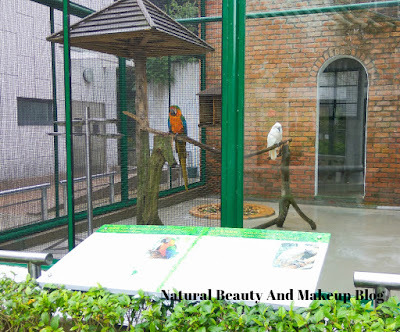 Nonetheless, I had never thought in my wildest dream ever that I would meet them from such a close distance, happy dance! 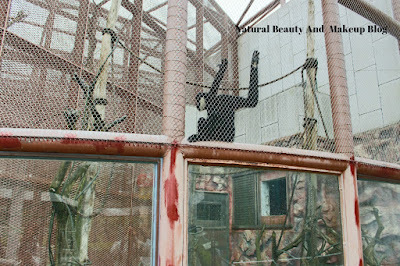 A red panda was sleeping! 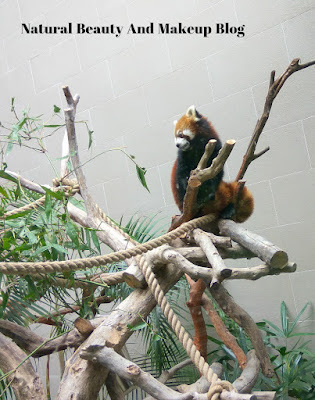 This red panda was chilling! Look who is busy munching on bamboo shoots!! 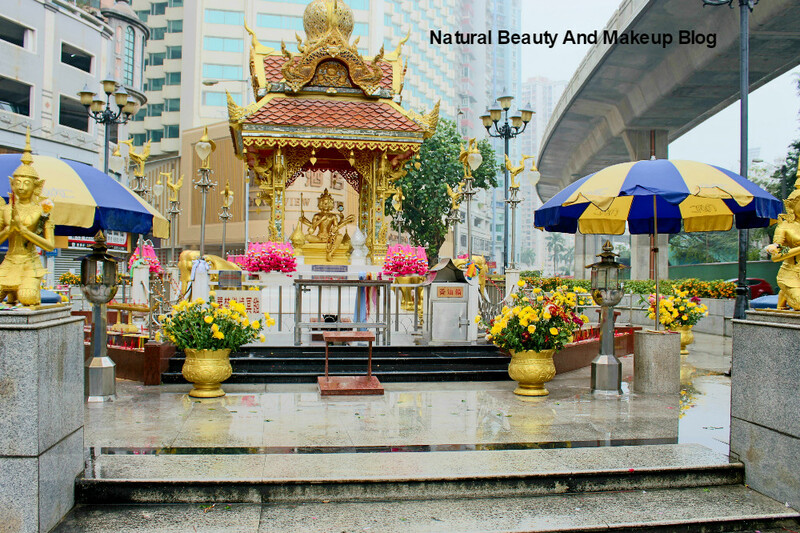 Close to the entrance of Seak Pai Van Park, the main gate of A-MA statue & Tin Hau temple is located. 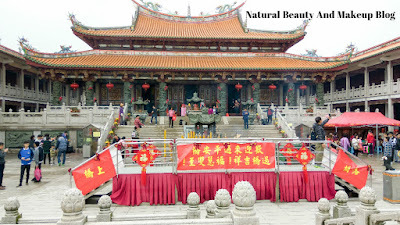 From there you can avail free shuttle mini buses to reach to the temple; otherwise hiking up the hill is quite a task! Set amidst lush greenery atop the hill, the A-MA cultural village overlooking the beach and the Cotai Strip is apt for unwinding oneself. 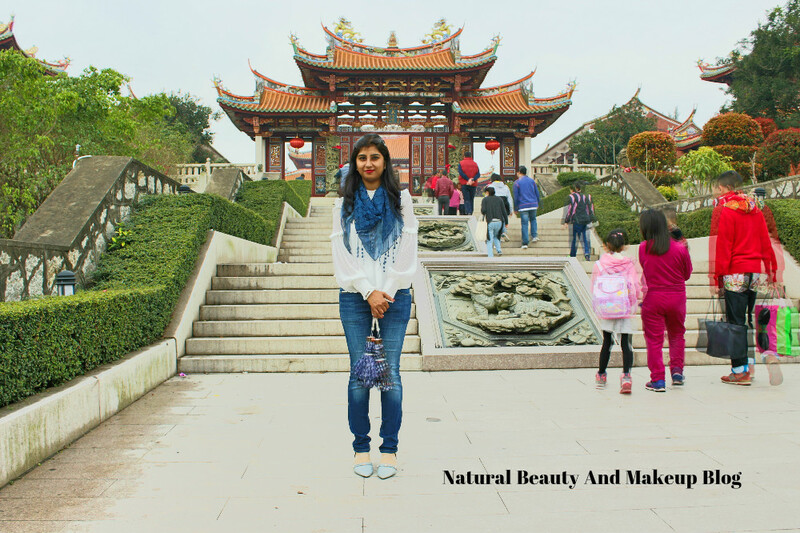 An awe-inspiring architecture right from the entrance of the grand cultural temple complex to the larger than life structure of idols inside the temple will leave you mesmerised. 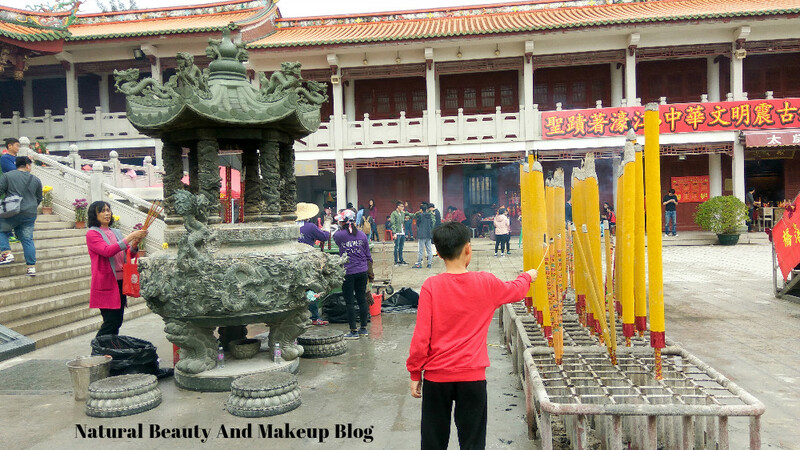 A-MA, Tin Hau and Mazu are the different names of the same Sea goddess, devotees from various places throng this place to worship this goddess by burning incense sticks and offering the prayers. 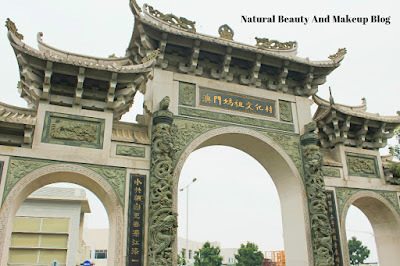 Photography is strictly prohibited inside, but you can take shots of the wonderful exteriors 😊. 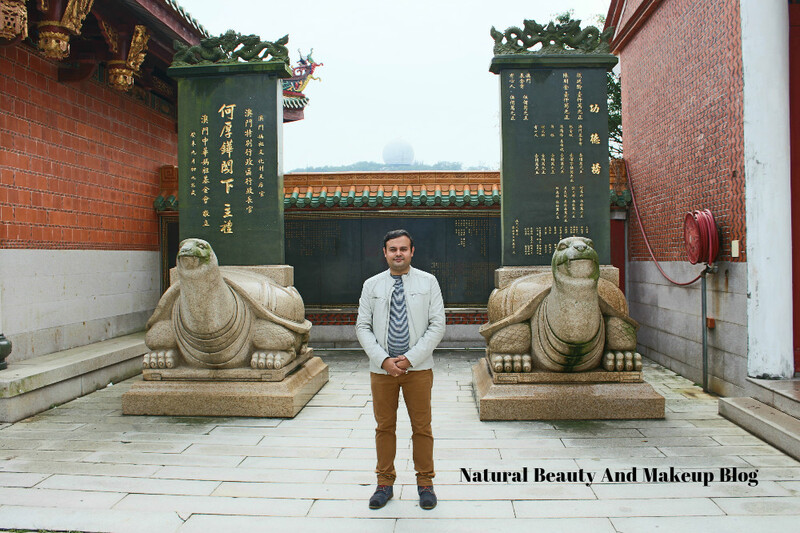 A few steps away from the Cultural Complex, the majestic A-MA statue is (2om-high, World’s tallest statue of goddess A-MA) nestled at the top of a hill, providing a stunning landscape view. 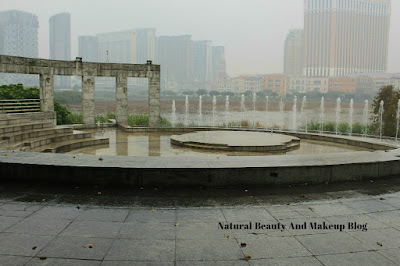 There is also a park located nearby, where you can get refreshed whilst enjoying the serenity. 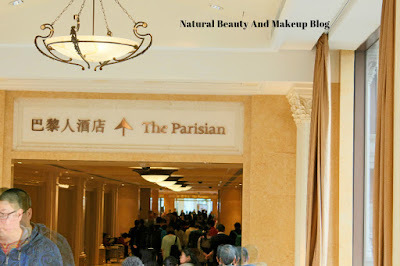 We caught the same free shuttle bus from the hilltop car park area to get down the hill and proceeded towards our next destination Cotai Strip. 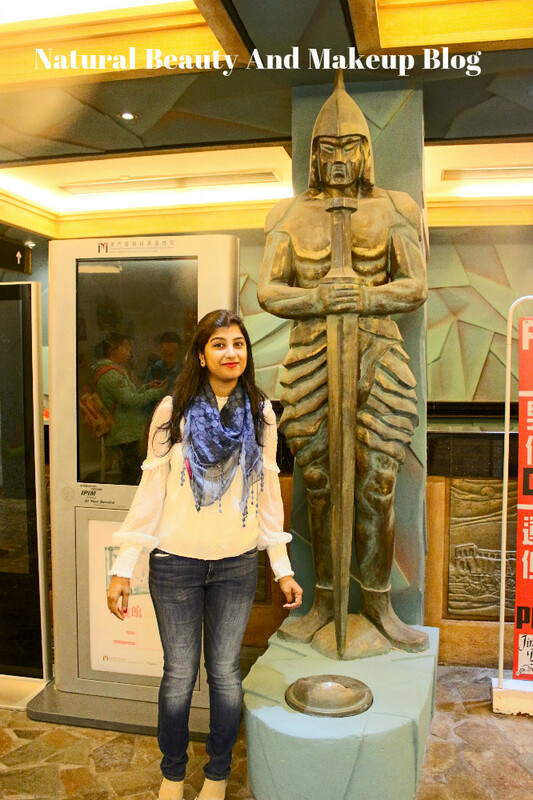 NB: A-MA statue's photo came out blurred, so couldn't publish here! Epitomising the most romantic destinations in the world -Venice and Paris, these two iconic luxurious hotels The Venetian and the Parisian simply cannot be missed while in Macau! 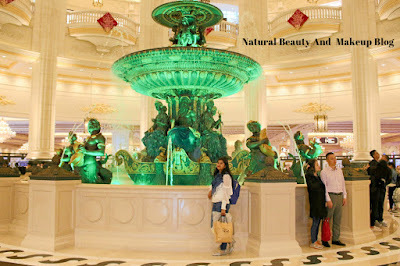 I was moved by the grandeur of these two landmarks, which include Casinos, innumerable shops, luxurious suites, and mind-blowing entertainment options. The gorgeous themed architecture of these hotels like pseudo-sky, the replica of Piazza San Marco & the Rialto Bridge at the Venetian to the Parisian style Mansard roofs, painted ceilings, huge lobby rotunda and a fountain of Neptune (Roman Sea God) modelled on Paris Place de la Concorde at the centre of the Parisian hotel are truly admirable; such a visual treat 😍. If Gondola ride is the star quotient of the Venetian then the Half-scale Eiffel Tower at the Parisian holds significance for its stark resemblance to the original iconic Eiffel Tower in Paris, both are beguiling! 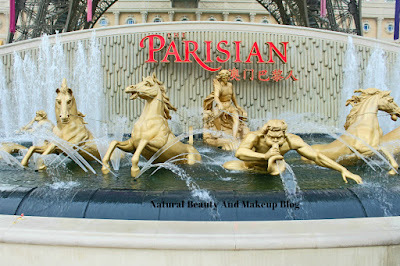 The Venetian Macao Resort Hotel is the largest casino in the world while the Parisian is the brand new luxurious hotel! 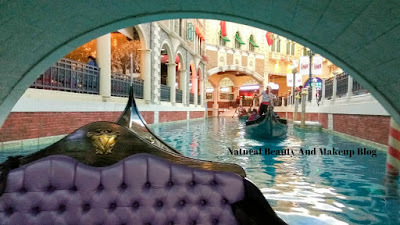 At Venetian, Gondola ride was our first preference, so booked a private gondola for us. The moment we boarded the gondola, we were asked about our country. Upon replying India, the whole crew greeted us with saying NAMASTE, felt so overwhelmed! 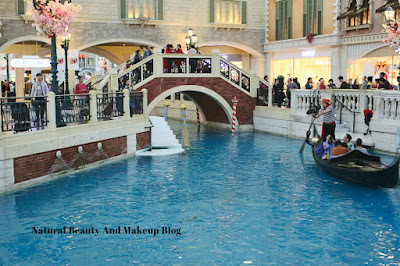 Our gondola ride couldn’t be more perfect without any gondolier songs. 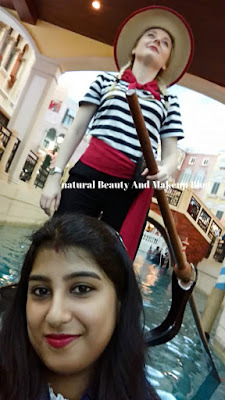 She (Italian gondolier) sung, we kissed and this moment got framed in our memories, something to cherish forever. Needless to say, the ride experience through the Grand Canal line was incredibly romantic 😊. 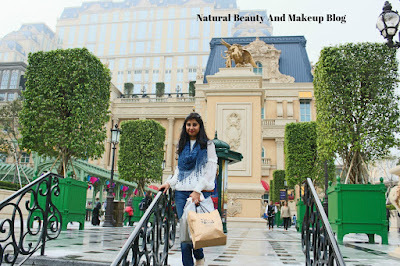 At the Cotai Strip, most of the hotels are interconnected or linked with walkways making it easy to access all these places. 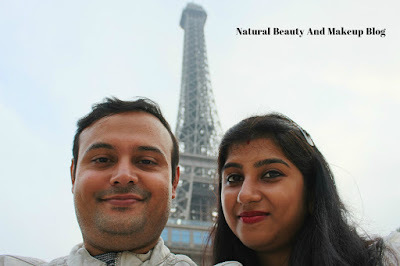 We didn’t buy tickets to go to the Eiffel Tower Observation Decks as we were running short of time already! 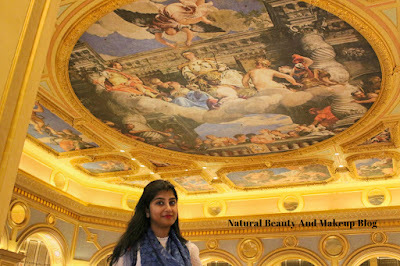 We enjoyed tasty snacks at the Venetian restaurants only and then headed back to our hotel. This time we missed watching all the amazing shows out there but saved it for our next visit. A Macau trip is incomplete without paying a visit to the Casinos. 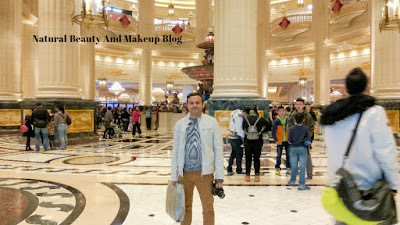 I nudged my husband to bits and then he took me to the Babylon Casino, located next to our hotel. 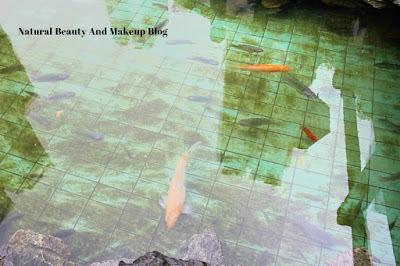 Sadly, I lost 500HKD to the table and felt terribly disappointed. Nevertheless, afterwards, we had a hearty dinner at Indian Garden restaurant and rejoiced every moment that we spent together on those two days. 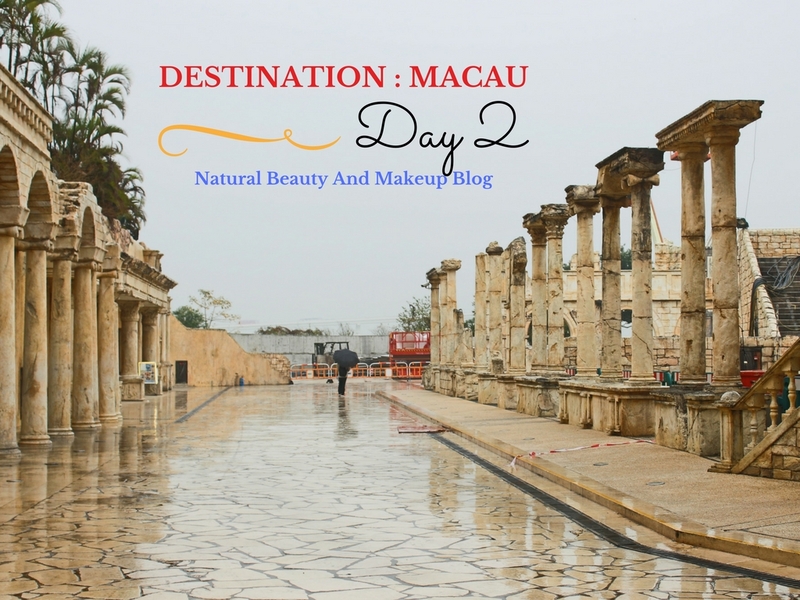 Our journey was going to end the next day, so I got supercharged to explore the rest handful places in Macao with my travelbuddy! 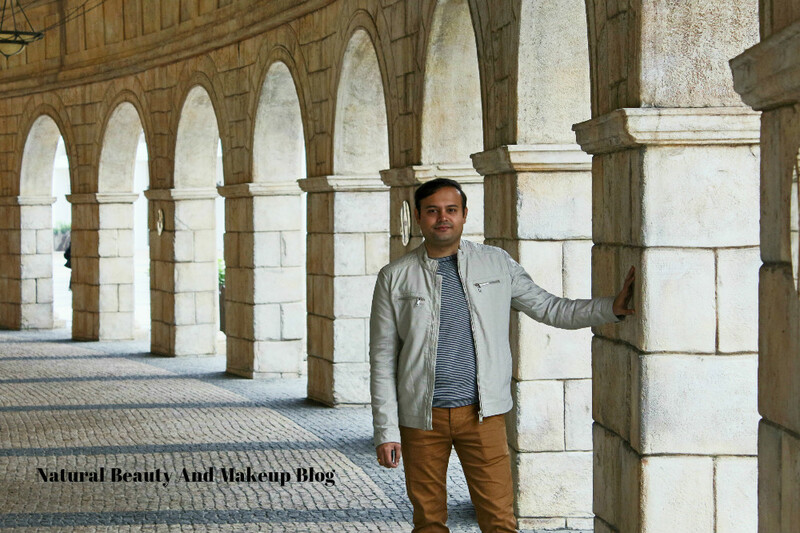 Hope you are enjoying my Macau Travel posts as much as I am enjoying by writing it 😊. If you have read my previous Macau Tidbits, here are few more! 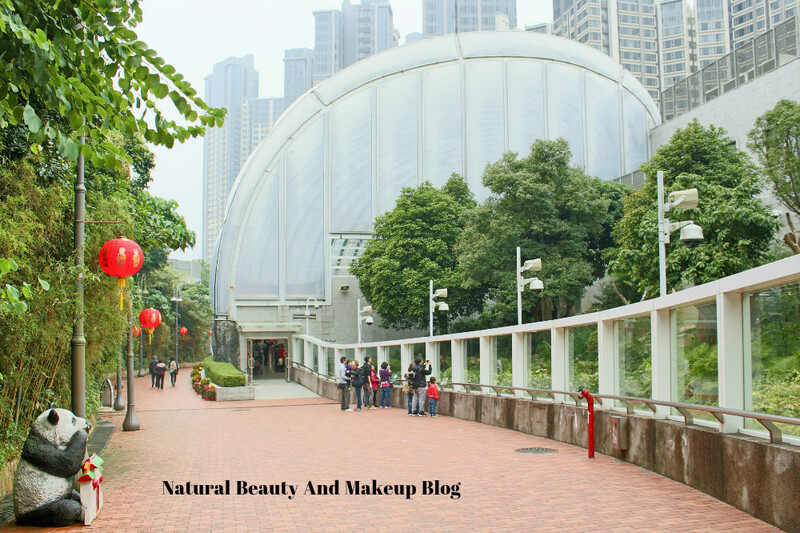 To reach to Taipa Village, few shortcuts are- a) From the Venetian west lobby/ hotel entrance, there is an escalator bridge or walkway, which will take you to Taipa in just 10 minutes. b) You can avail Taxis like we did from Fisherman’s wharf c) From the City Of Dreams, you can catch free shuttle buses that ply every 10-15minutes. 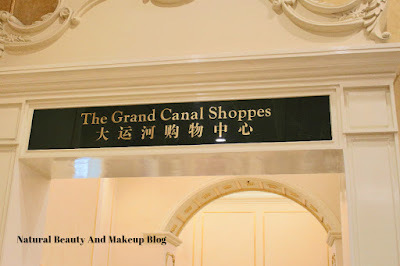 Venetian’s Grand Canal Shoppes you can spot on the 3rd floor, where you can take the Gondola ride as well as splurge on shopping! The private gondola ride might cost you an arm and a leg, so go for shareable rides. 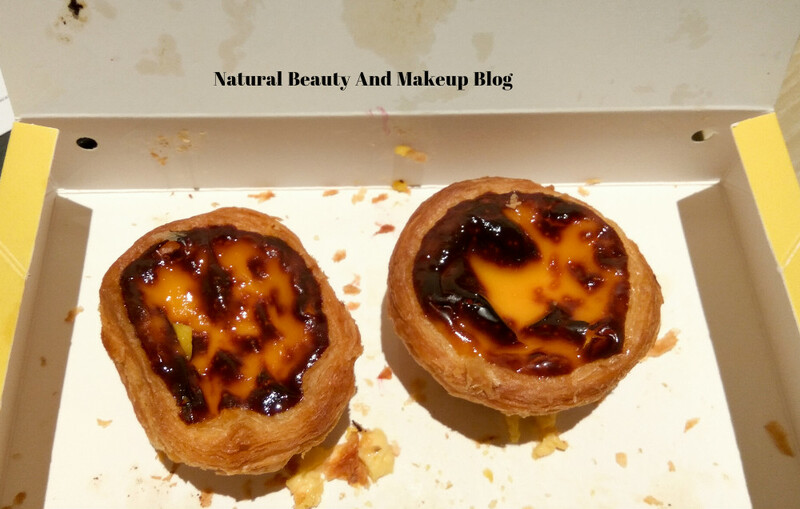 At the Venetian, you can find tasty egg tarts at Lord Stows Bakery. An Indian restaurant Golden Peacock is there to satiate your taste buds. 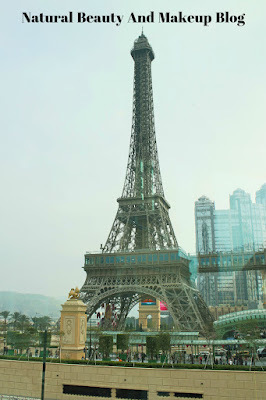 Do not miss out on Eiffel Tower Light Show at the Parisian and other world-class theatrical shows, stage shows at Cotai Strip. Keep a day for watching the shows only! 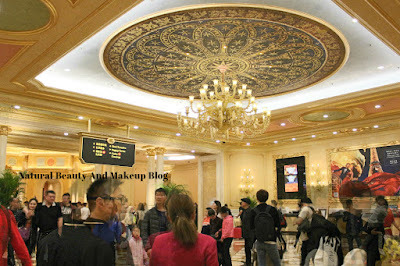 Hailing cabs from The Venetian or The Parisian at the peak hour can be a task, so don’t bargain much! Entry to any Casinos can be a little hassle if you don’t carry your passport along with you! 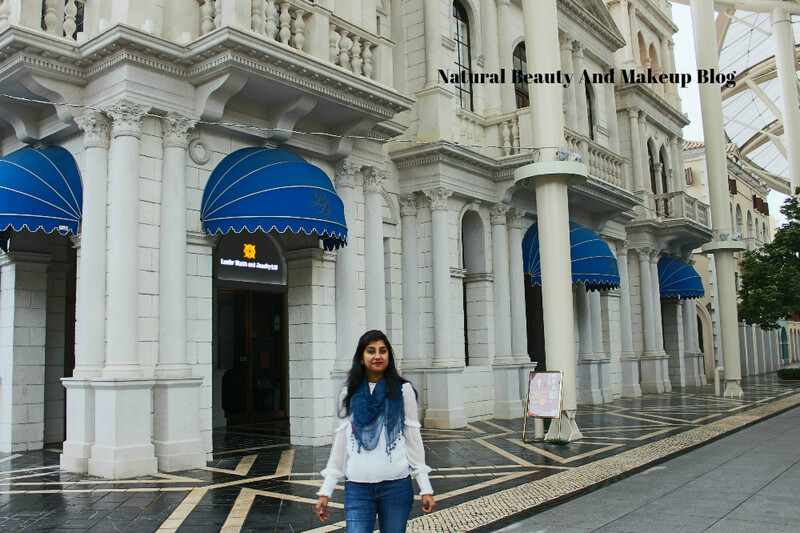 Also Read - Macau Diaries - Day 1 story. 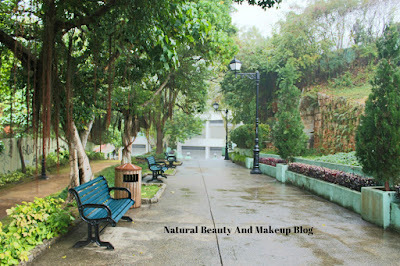 Looks like you had very lovely and great time there, despite of the heavy rain! Here in Poland, in Warsaw we also have red pandas in the Zoo, but I forgot is there one or two... Red panda is very cute, too! 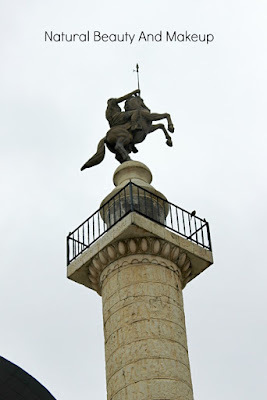 The giant is in Vienna, in Poland we have not. Wow, what an amazing destination! Need to put it on my bucket list. 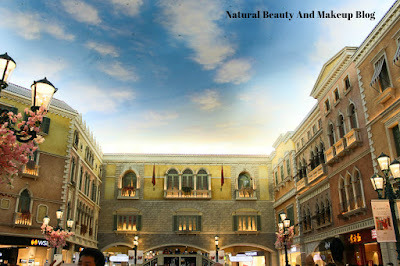 Worth the venture, Macau is on my travelling list too. 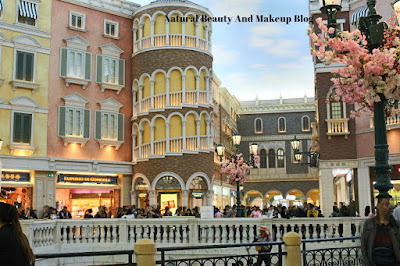 Gonna check out these place when I made my trip to Macau. 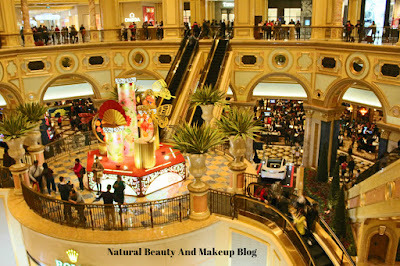 I really need to visit Macau, you have so many beautiful pictures of it. 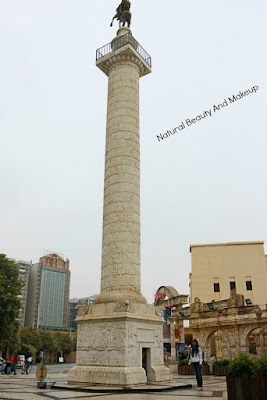 Nice post dear! 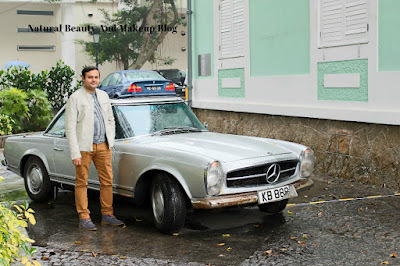 It is so good to see that you had an awesome time at Macau.Beautiful pictures and lovely post. I want to go there one day. 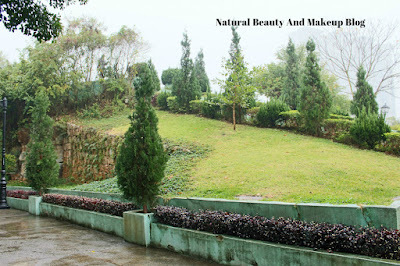 The place looks so beautiful. 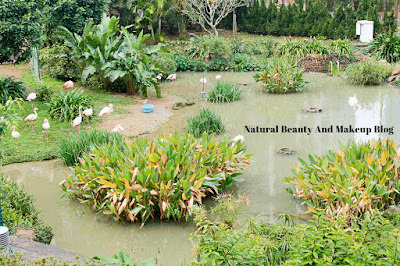 So beautiful place and stunning pictures. 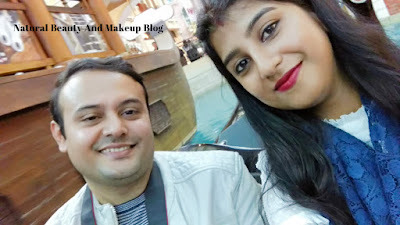 love the clicks…I am sure you are having loads of fun! Wow! Looks like you had a lot of fun! Macau is beautiful. 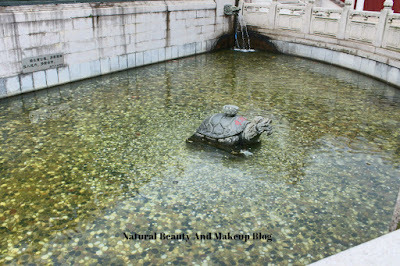 Never been there but it's on my list. Loved the pictures! Beautiful place. Will keep it in my travel list. Superb! Lovely pics and looks like you had a lot of fun. 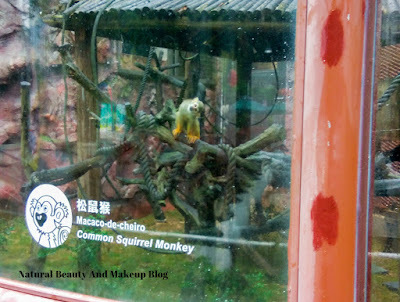 Haven't been to Macau yet. Ur post is giving me vacation goals. 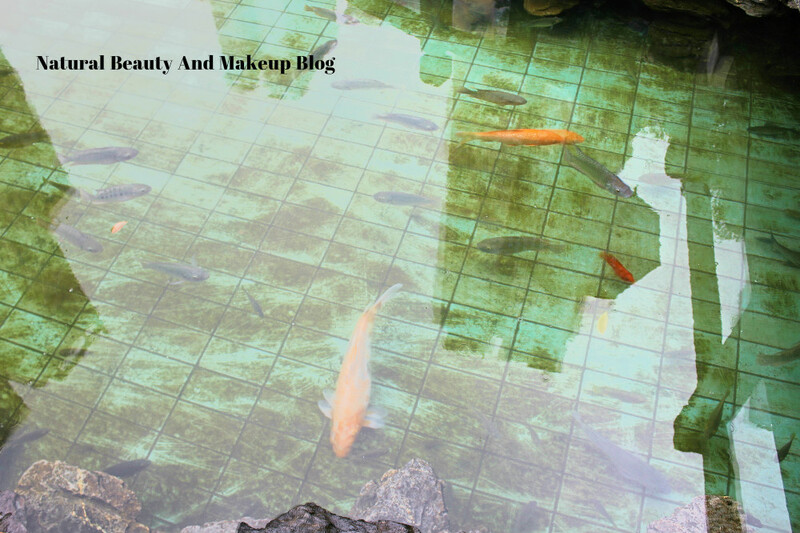 Love love love this post! Love how you have described everything here and your pictures are icing on the cake. Loved all the pictures and you look so cute!